We're now entering the final days of the current Fortnite season, which has run for longer than usual due to the Christmas break. To fill in the extra time after the week 10 Fortnite Battle Pass Challenges update, a new set of 20 Fortnite Overtime Challenges have been added. If you beat these then you'll unlock rewards such as loading screens, additional styles for some of the Battle Pass outfits and, most importantly, a shiny Fortnite Season 8 Battle Pass completely free for anyone who clears at least 13 of the free challenges before February 27! We've got the details of all of the available rewards, plus we'll explain what all the Fortnite Overtime Challenges are, and show you exactly what you need to do to beat them. If you're a Battle Pass holder, then three of the Fortnite Overtime Challenges will get you new styles for your outfits. After reaching Tier 47 for Powder, 71 for Trog, and 87 for Onesie, you'll then be presented with part two of that challenge, which involves completing a certain number of Overtime Challenges to unlock a new style for that skin as pictured above. The remaining 17 free Overtime Challenges reward plenty of XP, a wrap, a contrail, and a couple of loading screens, though the prize everyone will be most interested in is the free Battle Pass for Season 8 once you've completed 13 of the free challenges in total. All 20 of the Fortnite Overtime Challenges have now been revealed, and the details are as follows. Follow our advice for the individual Fortnite Overtime Challenges below, and you'll be blitzing your way through them all in no time. To collect Fortnite coins, you first need to switch to Creative mode from the game mode selection screen. Once you're in there, hit Play then launch a server to get started. This will drop you into a lobby, where you'll be presented with a series of rifts leading to Featured Creative Islands. Approach one and check the description to make sure they have coins, then jump in. You'll then get to play the featured map, where you need to look out for large floating coins to collect by passing through them. We found MOVE! by tollmolia was simple to use for this, and at any point you can pause then either reset the map or quit and try a different one, and your coins will be retained - grab 15 in total and you're done. Finding a Supply Drop in a match can be tricky, as they normally don't appear until the later stages of the battle and are highly sought after. 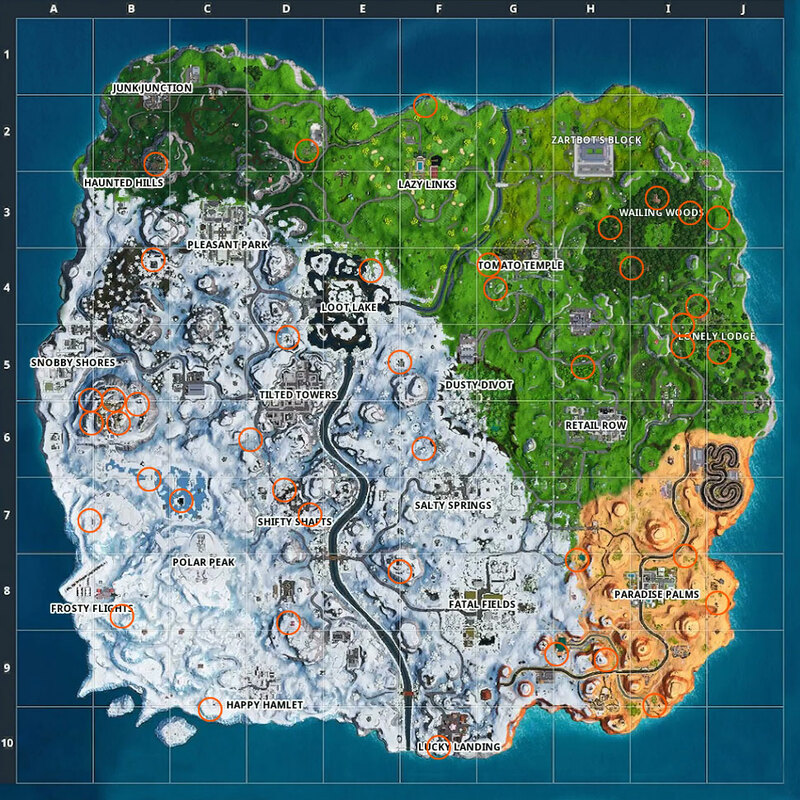 However, the recently added Driftin' LTM spawns a large number of Supply Drops near the start of the round, so for most players this will offer the best chance of grabbing one. If you deploy your glider as soon as you leave the battle bus, you can scan the area below you then hone in on a Supply Drop when they appear. To have the option of reviving another player, you need to be in a Duos or Squads mode with at least one other person on your team. For this challenge you need to revive another player in three different matches, and the easiest way to get it done quickly is to pair up with a friend. Once you land, have them grab some materials and build a ramp high enough to knock themselves out with fall damage from the top, then revive them and that's one ticked off - return the favour if you can, then finish the match and repeat a couple more times to be done with this one. We were originally meant to receive Fortnite Driftboards back in December 2018, but they have now finally made an appearance with the recent 7.40 update. For this challenge, you'll need to Squad up with a friend, then play three matches of the Driftboard LTM with them. Since the feature was added, you can't help but notice the flurry of activity on the game feed at the start of each match as players thank the driver for their tireless service. Hopefully you've been polite and doing the same, but if you're still not sure how to thank the driver in Fortnite then all you need to do is push down on the d-pad while you're still aboard the battle bus. "Cheers, drive!" If you've not been racking up the Victory Royales, then outlasting 75 opponents may sound like a daunting prospect, but don't stress as it's actually not that hard to survive until the final 25 or so players remain. If you remain on the battle bus until you're kicked off at the end, then immediately open your glider and slowly drift down to the island, you can often outlive at least 50 opponents by the time you reach the ground. If you're not confident with combat, then find a good spot to hide within the circle - crouching in a bush will allow you to hide in plain sight - and wait for your opponents to whittle each other down. Dress to impress? This is the best Fortnite merch to wear as you floss your way to Victory Royale.